Abbotsford is a city located in British Columbia, adjacent to the Canada–United States border, Greater Vancouver and the Fraser River. With an estimated population of 141,397 people it is the largest municipality in the province outside Metro Vancouver. Abbotsford-Mission has the third highest proportion of visible minorities among census metropolitan areas in Canada, after the Greater Toronto Area and the Greater Vancouver CMA. It is home to Tradex, the University of the Fraser Valley, and Abbotsford International Airport. "One with the strength of two"
As of the 2016 census, it is the largest municipality of the Fraser Valley Regional District and the fifth-largest municipality of British Columbia. The Abbotsford–Mission metropolitan area of around 180,518 inhabitants as of the 2016 census is the 23rd largest census metropolitan area in Canada. It has also been named by Statistics Canada as Canada's most generous city in terms of charitable donations for nine straight years. 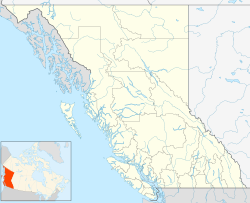 The community of 375.55 square kilometres (145.00 sq mi) is the largest city by area in British Columbia. The municipality's southern boundary is the Canada–United States border. In Canada, it is bordered by the Township of Langley to the west, the District of Mission to the north, and the City of Chilliwack to the east. Much of Abbotsford has views of Mount Baker (to the southeast, in Washington) and the Coast Mountains (to the north). Abbotsford's colonial development began when the Royal Engineers surveyed the area in response to the gold rush along the Fraser River in 1858. This led to the building of Yale Road (today Old Yale Road), the first transportation route to link the Fraser Valley. The settlement grew and the production of butter, milk and tobacco began by the late 1860s. In 1889, former Royal Engineer John Cunningham Maclure applied for a Crown grant to obtain the 160 acres (0.65 km2) that would become Abbotsford. There is some controversy over the origin of the Abbotsford name. The most commonly cited origin is that Maclure named the land "Abbotsford" after family friend Henry Braithwaite Abbott, the western superintendent of the Canadian Pacific Railway. Until 1922 the name was spelled Abottsford. Maclure's sons later stated that the property had actually been named for Sir Walter Scott's home, Abbotsford, and pronounced it with the accent on ford, while in his later years Maclure himself claimed that the naming had been "a combination of two ideas". The title passed hands to Robert Ward, who filed a townsite subdivision on July 9, 1891. Also in 1891, the CPR built a railway line through the area that connected Mission with the Seattle, Lake Shore and Eastern Railway at Sumas, Washington. This route was the only rail connection between Vancouver and Seattle until 1904. The Village of Abbotsford was incorporated in 1892. At that time Robert Ward sold many of the lots to private investors, but also sold off a significant portion to the Great Northern Railway's subsidiary company the Vancouver, Victoria and Eastern Railway. The British Columbia Electric Railway (BCER) arrived in 1910. The Interurban, as the BCER tram linking Abbotsford with Vancouver and Chilliwack was called, was discontinued in 1950, but BCER's successor BC Hydro retains the right to re-introduce passenger rail service. Service to Vancouver runs from neighbouring Mission by way of the West Coast Express. The most notable natural disaster to hit Abbotsford was a major flood of the Fraser River in 1948. In September 1984 Pope John Paul II held an open-air mass for over 200,000 people at the Abbotsford International Airport. The amalgamation of the Village of Abbotsford and the District of Sumas into the District of Abbotsford occurred in 1972. The District of Abbotsford amalgamated with the District of Matsqui in 1995 to become the City of Abbotsford, raising the population significantly. In June 2013, the City of Abbotsford spread chicken manure on a homeless camp located in the city. Abbotsford Mayor Bruce Banman publicly apologized for the incident. A lawsuit was launched on behalf of some of the homeless, stating that a bylaw which prevents overnight camping in Abbotsford parks is against their right to shelter. The city has formed a homelessness action plan, and has approved a proposal for a supportive housing facility. The city of Abbotsford has a long and ongoing history of gang-related crime (Particularly the illegal sale of controlled substances and violence.) and efforts to reduce it. Abbotsford City Council comprises a council-manager form of local government. The mayor and council were elected on November 15, 2014. The mayor is Henry Braun (50.91% of the popular vote). Councillors elected in 2014 were: Patricia Ross (7.97%), Les Barkman (6.42%), Moe Gill (6.15%), Ross Siemens (6.04%), Brenda Falk (5.72%), Dave Loewen (5.59%), Kelley Chahal (5.21%), and Sandy Blue (5.16%). School trustees elected are: Cindy Schafer (9.72%), Stan Petersen (9.39%), Shirley Wilson (9.04%), Rhonda Pauls (8.89%), Preet S. Rai (8.74%), Freddy Latham (8.29%), and Phil Anderson (7.55%). The Abbotsford flag and coat of arms are the same, featuring straight, diagonal crosses representing Abbotsford as at a "crossroads". At the centre is a strawberry blossom to symbolize the local berry industry. The flag of Abbotsford was originally blue in colour. The change to green was initiated in 1995 when the District of Abbotsford and the District of Matsqui amalgamated to create the City of Abbotsford. According to the 2011 Census, 65.74% of Abbotsford's population have English as mother tongue; Punjabi is the mother tongue of 18.71% of the population, followed by German (4.32%), Dutch (1.12%), Korean (1.00%), French (0.83%), Spanish (0.74%), Vietnamese (0.47%), Chinese, n.o.s. (0.45%), and Tagalog (0.44%). The Abbotsford metropolitan area has Canada's highest proportion of ethnic South Asians. In 2016, the City of Abbotsford had 35,310 South Asians, while the Abbotsford CMA had 38,250. Indo-Canadians in Abbotsford have worked in berry farms and in area businesses. Members of the ethnic group first arrived in the 1920s. Abbotsford has the third highest proportion of visible minorities among Census Metropolitan Areas in Canada, after the Greater Toronto Area and Greater Vancouver. The largest ethnic group is European, comprising approximately 64% of the population. This group includes German, Dutch, British, Irish, Scandinavian and Slavic ethnic origins. The next largest ethnic group in Abbotsford is South Asian (countries of India, Pakistan, Bangladesh, Nepal, Bhutan, Maldives and Sri Lanka) comprising 21.7% of the population. This is followed by Aboriginals at 6.2% of the population (which includes indigenous peoples from other parts of Canada and the United States) and Chinese at 1.4%. More than a quarter (26.1%) of the city's population was born outside Canada. Of that percentage, a majority is from South Asia, followed by groups from China, South Korea, Southeast Asia and Latin America. English is the primary language spoken, with 78.7% of the population having it as their first language. 1Census Canada does not distinguish between European and North American French origins. This category includes Acadians; Québécois-only (not multiple responses) are in North American origins. The majority of Abbotsford's population is Christian, with 61.4% of the population. The Lutheran and Anabaptist (Mennonite Brethren and Mennonite Church) denominations make up the largest congregations. The next largest religious group is Sikh, comprising 13.4% of the population. The city contains the first Sikh Gurdwara built in Canada (in 1911), and the oldest in North America. A National Historic Site, located in the Clearbrook neighbourhood, it is now over 100 years old. Abbotsford has an oceanic climate (Köppen climate type Cfb), with just enough summer precipitation not to be classified as warm-summer mediterranean. Some 62% of residents in Abbotsford work in the City of Abbotsford itself. Most of the remaining 38% commute to Mission, Chilliwack or Vancouver and its suburbs (primarily Surrey and Langley). More than 25% of Abbotsford's work force commutes to Abbotsford from other municipalities. The Conference Board of Canada has identified the local economy as one of the most diverse in the country. Abbotsford's main industries are agriculture, transportation, manufacturing and retail. The city earns the highest dollar per acre of agricultural land in the country, greater than the Niagara Region and the North Okanagan. Abbotsford Regional Hospital and Cancer Centre and community health services make Fraser Health the city's largest employer with about 2,500 staff. The city is also home to three federal prisons, each of which employs between 200 and 500 officers and support staff. There is also a growing aerospace industry led by Cascade Aerospace and Conair Group Inc.
Local and privately owned confectionery company Brookside Foods was acquired by The Hershey Company in 2011. In 2016, it announced it would be closing. Forty-six public elementary, middle, and secondary schools are administered by the Abbotsford School District. This includes a virtual school called the "Abbotsford Virtual School" that offers more than 30 semestered online courses. This school offers a unique animation and modeling program that teaches students aspects of the video game industry. Post-secondary institutions in the city include the University of the Fraser Valley, religious institutions such as Columbia Bible College and Summit Pacific College, as well as career colleges such as Career Gate Community College, Sprott Shaw College, Vancouver Career College, Métis Skills and Employment Centre, and CDI College. The Abbotsford Arts Council hosts a number of free local events including music in Mill Lake Park, the Arty Awards and more recently, the Christmas Artisan Gift Fair. It has been involved in projects such as the Abbotsford "Unity Statue", Abbotsford Christmas Craft Fair, Art in the Park, Abbotsford's Art and Heritage Unity Festival, and the Historical Downtown Art Bench Project. As well as maintaining the Kariton Art Gallery which features and hosts exhibitions from local artists of all mediums residing in the Lower Mainland. The Reach Gallery Museum features exhibitions from across Canada and around the world, as well as the work of local artists. It houses a heritage archive, runs special events, programs and courses and seeks to promote local arts and culture. Trethewey House Heritage Site features a restored 1920s Craftsman-style house built by J.O. Trethewey, one of the owners of the lumber and shingle mill that gave Mill Lake Park its name. The municipally designated heritage house and adjacent gallery are open to the public for special events, educational programming, and drop-in tours. Gallery 7 Theatre and Performing Arts has been one of Abbotsford only performing arts organizations since 1991 and operates out of Mennonite Educational Institute. They produce four mainstage productions every year. Public bus transportation is provided by the Central Fraser Valley Transit System. Passenger rail service to Vancouver currently runs from nearby Mission by way of the West Coast Express. Air links are provided by the Abbotsford International Airport. WestJet provides regular scheduled service from the airport, due to its proximity to Vancouver's eastern suburbs. The airport is also the home of the annual Abbotsford International Airshow. Major transportation routes leading into Abbotsford are the Trans-Canada Highway (No. 1), the Abbotsford-Mission Highway (No.11) and the Fraser Highway (No. 1A). Access to the United States is via the Abbotsford-Huntingdon/Sumas border crossing. Due to its proximity to Vancouver, most Vancouver television and radio stations are also available throughout the Fraser Valley, although in a few cases there are repeater stations licensed to different centres in the region. Some stations from Washington State are also available in the Fraser Valley due to its proximity to the border. The first radio station in the Fraser Valley was CHWK Chilliwack established in 1927, the company established CFVR in Abbotsford in 1962. Initially the station originated local programming in the morning and then repeated the Chilliwack broadcasts the rest of the day. Country 107.1, part of Rogers Digital Media, serves the Fraser Valley with "Today's Best Country". From 2009 until 2014, Abbotsford hosted the NHL's Calgary Flames' AHL affiliate, the Abbotsford Heat. Home games were played at the Abbotsford Entertainment & Sports Centre. Beginning in late 2012, the BC Angels of the Legends Football League's LFL Canada division began play at the Abbotsford Entertainment & Sports Centre. Abbotsford's Jane and Gerry Swan Track at Rotary Stadium is home to the Valley Royals Track & Field Club, who have produced numerous Olympians including two for the 2008 Olympics. Rotary Stadium was also home to the now-defunct Canadian Junior Football League's Abbotsford Air Force. The Abbotsford Pilots of the Pacific International Junior Hockey League (junior B level) play at MSA Arena, which is Abbotsford's second largest arena at just over 400 seats. Abbotsford was considered as a possible home for the Chilliwack Chiefs (junior A), who were forced to move in 2006 when the Chilliwack Bruins (a WHL expansion team) took over their arena, Prospera Centre. Abbotsford would have become the home of the Chiefs if the city had supported them in building a new arena; instead, the Chiefs moved to Langley. Construction has now been completed in Abbotsford on a far bigger sports and entertainment centre (with 7,500 seats). Abbotsford Minor Hockey is one of the largest associations in British Columbia with more than 1000 players registered from the ages of 5 through 18 years old. This association is recognized by many as a model and a leader in the development of minor hockey programs, and several Abbotsford-raised players have gone on to the highest levels of this sport. In the 2005–2006 hockey season, Abbotsford's bantam AAA team were ultimately the Western Canadian Bantam Champions, and eight individual players from this team (the most ever) were selected in the 2006 WHL Bantam Draft. Abbotsford has a superior youth soccer program, winning two national titles, and numerous provincial titles. It is also home of soccer all-stars Sophie Schmidt, Brad Petoom and Adam Lang. Abbotsford is home to the Abbotsford Mariners of the United Soccer Leagues Premier Development League, the highest level of amateur soccer in North America. Abbotsford is home to many high school sports, with Abbotsford Collegiate, W.J. Mouat Secondary, Rick Hansen Secondary, Robert Bateman Secondary, St. John Brebeuf Secondary, Yale Secondary, and the Mennonite Educational Institute, among others, doing very well in track and field, volleyball, basketball, and football. These schools have consistently ranked among the highest in the province. The Yale Secondary senior boys basketball team, under Coach Al Friesen, won the 2008 'AAA' provincial boys' basketball championship. Abbotsford's rugby club supports three men's teams, two women's teams, U19 men's and women's, U15 U16 and U17 men's, and a great mini rugby program. Many of Abbotsford's players have gone on to play for Canada, such as Erin Lockwood, Ryan McWhinney, Scott Hunter and Brodie Henderson. In Olympic sports, Abbotsford's Alana Kraus has won medals in short-track speed skating. In 2005, the Abbotsford–Mission metropolitan area had the highest property crime rate and the second highest violent crime rate for cities with a population of 100,000 to 500,000 in Canada. The metropolitan area had the highest rate of homicides nationally for two years running (2008 and 2009) with a rate of 5.22 homicides per 100,000 population, compared with the national average of 1.81. In 2010, the rate was 2.3. The City of Abbotsford has its own municipal police force, one of eleven municipal police forces in British Columbia. It is the third largest municipal police force in British Columbia (behind Vancouver and Victoria). As of 2006[update], the Abbotsford Police Department employed nearly 200 officers and 80 civilian employees. The Abbotsford Police Department was officially formed in 1995 when the District of Matsqui and the District of Abbotsford amalgamated to become the City of Abbotsford. Prior to the amalgamation, the District of Matsqui was patrolled by the Matsqui police and the District of Abbotsford by the RCMP. During the referendum citizens elected to keep a municipal police force. These places represent parts of the city that have more than one neighbourhood in them. ^ "City of Abbotsford - City Council". www.abbotsford.ca. ^ a b Canada, Government of Canada, Statistics. "Population and Dwelling Count Highlight Tables, 2016 Census". www12.statcan.gc.ca. ^ a b "Population and dwelling counts, for Canada, census metropolitan areas, census agglomerations and census subdivisions (municipalities), 2006 and 2001 censuses – 100% data". 2.statcan.ca. January 6, 2010. Retrieved March 10, 2011. ^ a b c "B.C. is nation's most ethnically diverse province: StatsCan". CBC News. April 2, 2008. ^ "2011: The year in review in Abbotsford". Abbotsford News. Archived from the original on April 19, 2012. Retrieved December 30, 2011. ^ a b Thorburn, Mark (2009). British Columbia Place Names. Dragon Hill Publishing Ltd. p. 336. ISBN 978-1-896124-46-9. ^ "Abbotsford Airport - Airport History". abbotsfordairport.ca. ^ Jackson, Emily (November 26, 2013). "Homeless Residents to Sue Abbotsford for Chicken Manure Incident". Metro Vancouver. ^ Woo, Andrea (July 24, 2013). "Homeless group set to sue Abbotsford for harassment". The Globe and Mail. ^ Hellinger, Mike (June 5, 2015). "Abbotsford Protest to Mark Anniversary of "Chicken Manure Incident"". Star 98.3. ^ "'It is not safe': Abbotsford Police issue public warning over gang violence - BC | Globalnews.ca". globalnews.ca. February 24, 2017. Retrieved February 19, 2019. ^ "Gangs, drugs and homelessness among key city issues, says police chief". Abbotsford News. October 25, 2017. Retrieved February 19, 2019. ^ Aug 19, Daniel Schwartz · CBC News · Posted:; August 19, 2011 6:57 AM PT | Last Updated:; 2011. "Notorious gangs of British Columbia | CBC News". CBC. Retrieved February 19, 2019. ^ "Gang Busters: Abbotsford Police gang crime unit tackles the issues". Abbotsford News. October 26, 2018. Retrieved February 19, 2019. ^ Staff (November 16, 2014). "Abbotsford election results 2014: Full results". Global News. ^ "City of Abbotsford - Oops, please update your bookmarks!" (PDF). abbotsford.ca. ^ "British Columbia – Municipal Census Populations (1921–2011)". BC Stats. Retrieved May 9, 2013. ^ In 1976, the amalgamation with the District of Sumas raised the population. Previous figures were for the square mile of Abbotsford only. ^ In 1995, the amalgamation with the District of Matsqui raised the population. ^ "Community Profiles from the 2011 Census, Statistics Canada - Census Subdivision". 2.statcan.gc.ca. December 6, 2010. Retrieved April 13, 2013. ^ "CENTRE FOR INDO-CANADIAN STUDIES AND RESEARCH at University College of the Fraser Valley" (Archive). University College of the Fraser Valley. p. 3 (PDF p. 4/14). Retrieved on October 20, 2014. ^ "City of Abbotsford" (Archive). Canada Mortgage and Housing Corporation. Retrieved on October 19, 2014. ^ "Profile of Ethnic Origin and Visible Minorities for Census Metropolitan Areas and Census Agglomerations, 2006 Census, Census Canada/Statistics Canada". 2.statcan.ca. December 6, 2010. Archived from the original on June 29, 2011. Retrieved March 10, 2011. ^ "Profile of Ethnic Origin and Visible Minorities for Census Metropolitan Areas and Census Agglomerations, 2006 Census". 2.statcan.ca. June 10, 2008. Archived from the original on March 2, 2009. Retrieved March 10, 2011. ^ "Abbotsford A". Canadian Climate Normals 1981–2010. Environment Canada. Retrieved May 14, 2014. ^ "ABBOTSFORD A". Environment Canada. Retrieved July 15, 2015. ^ "Daily Data Report for November 2016". Environment Canada. Retrieved November 15, 2016. ^ "City of Abbotsford Top Employers - 2008" (PDF). City of Abbotsford. Retrieved April 20, 2014. ^ "Hershey Reaches an Agreement to Acquire Brookside Foods Ltd". businesswire.com. December 8, 2011. ^ "Hershey to close Brookside Abbotsford factory with loss of 180 jobs". ^ "Abbotsford School District - Respect. Opportunity. Innovation". sd34.bc.ca. ^ ""The CFVR Story" as told in an internal publication on the occasion of CFVR's 25th anniversary". Van Radio Museum. 1987. Retrieved November 24, 2016. ^ "Country 107.1". Country 107.1. Retrieved October 1, 2014. ^ "Abbotsford News - Abbotsford News". www.abbynews.com. Retrieved January 15, 2016. ^ "Abbotsford Today". Today Media Group. Retrieved September 18, 2016. ^ "The HEAT is on for 2009–10 AHL season" (PDF). Fraser Valley Sports & Entertainment Ltd. May 14, 2009. Archived from the original (PDF) on July 11, 2011. Retrieved May 14, 2009. ^ "Abbotsford Heat leave city with $12M in losses". cbc.ca. April 15, 2014. ^ "LFL Canada Releases BC Team Name & Logo". www.lfl360.com. Retrieved February 20, 2012. ^ "Abbotsford sports website". Sporttowncanada.com. Archived from the original on August 27, 2008. Retrieved March 10, 2011. ^ "ARFC - Abbotsford Rugby Football Club". abbotsfordrugby.com. ^ Vancouver, The (July 21, 2006). "Abbotsford is Canada's theft capital". Canada.com. Archived from the original on July 21, 2010. Retrieved 2011-03-10. ^ "Homicides by census metropolitan area". Statcan.gc.ca. October 26, 2010. Retrieved March 10, 2011. ^ "Homicides by province and territory". Statcan.gc.ca. October 26, 2010. Retrieved March 10, 2011. ^ "B.C. city officially ditches murder capital moniker". Archived from the original on January 11, 2012. Retrieved April 30, 2013. ^ 深川市役所. "北海道深川市｜ 姉妹都市カナダ・アボツフォード市". 北海道深川市. Wikivoyage has a travel guide for Abbotsford. Wikimedia Commons has media related to Abbotsford, British Columbia.